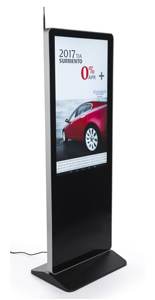 What is the best way to apply pinpoint advertising in a commercial setting? 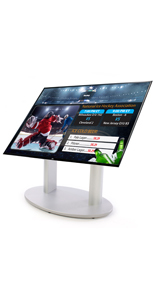 Standing digital signage systems take this special technology and make it mobile. 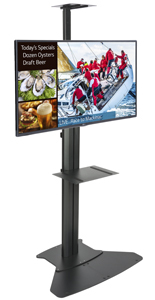 When a wall mounted monitor can't get the job done, place one out on the floor to garner the necessary attention. 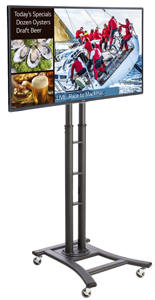 We sell standing digital signage systems that come with everything you need in one convenient package. 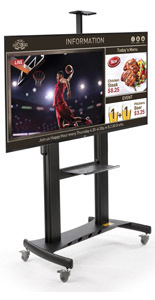 You get the floor stand, LED monitor, and integrated software rolled into one low price. 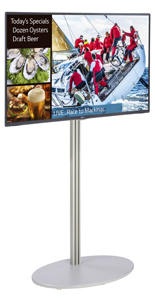 What kind of content do you wish to display? 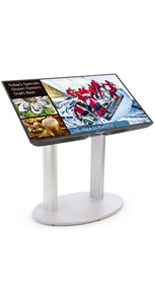 Simple images like slides aimed at office employees or students are one type. 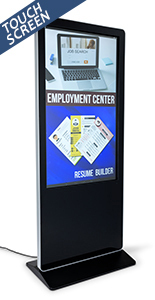 Use the standing digital signage systems to inform workers of company policies, sales reports, schedules, upcoming events, and more. How about the retail sector? 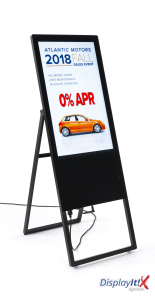 In this case, enticing customers with targeted content is key. 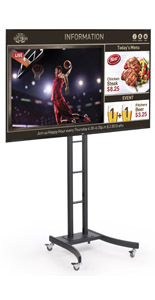 Restaurant and bar owners push food and drink specials alongside a televised game. 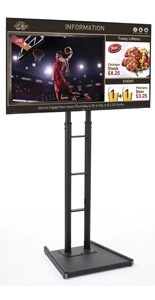 Clothing shops advertise seasonal sales promotions. 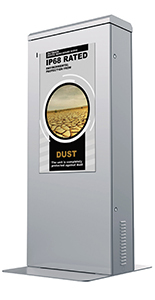 Toss in financial institutions, hotels, hospitals, and transportation hubs, and you get an idea of just how widespread the application is. 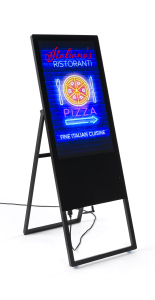 What are the three main components of these electronic sign solutions? 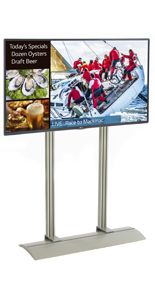 Our standing digital signage systems come with commercial-grade LG® LED TVs. 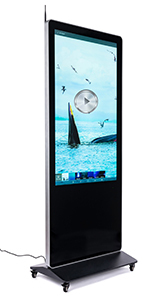 Offered in three sizes, the monitors come with a professional 2-Year Parts & Labor Warranty. 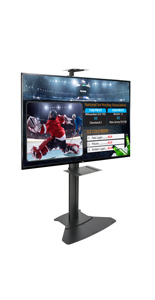 With a high 1920x1080 screen resolution, you can rest assured your televised content will always look sharp. 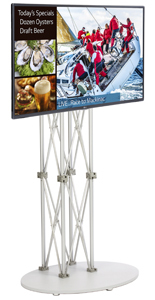 We sell a wide variety of floor stands to fit many types of applications. 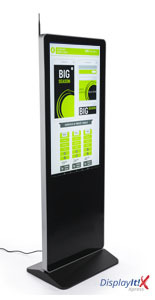 Some models are designed to be assembled and placed at a designated spot. 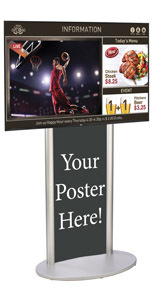 Others come with knockdown designs which are better suited for trade show use or temporary setups. 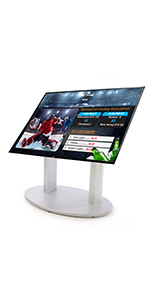 When the name of the game is electronic floor stands, software is the all-important feature. We offer two choices. 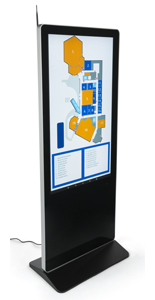 One is an online service (provided by Displays2go) that offers users a quick and easy resource for getting started. 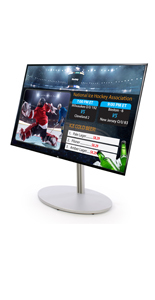 The other comes bundled with the LG® monitor and is much more advanced. 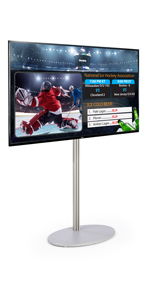 This software allows for a video presentation or slide show to be displayed alongside live TV. 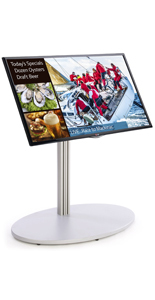 Freestanding menu boards incorporate DisplayIt!Xpress connectivity via Wifi connectivity. 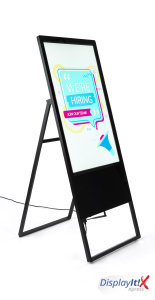 These new e-poster stands work with Android operating systems. 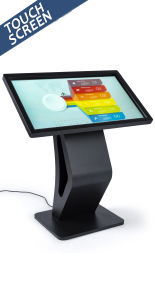 They include an integrated management console with a one-time fee - no hidden costs! 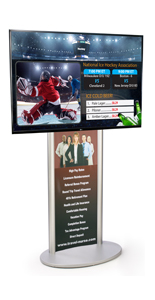 Push dynamic multimedia from the office to your console and schedule ad campaigns from afar using a simple interface. Intimidated by tech? Don't be! 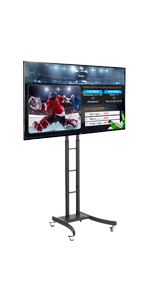 Enjoy life-time support with your initial purchase and you'll be a pro in no time. The floor stand selection is quite large. 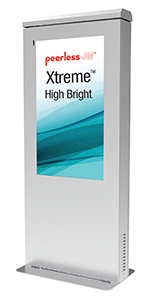 Models constructed from aluminum feature anodized finishes. 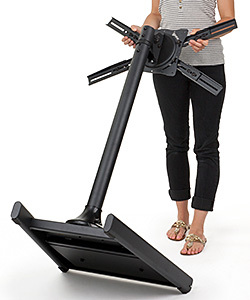 The heavy-duty steel stands come powder-coated. Both styles are offered in black or silver. 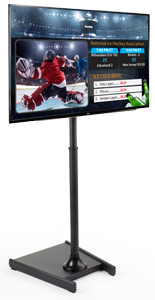 The aforementioned knockdown models are designed to be assembled and disassembled over and over again. 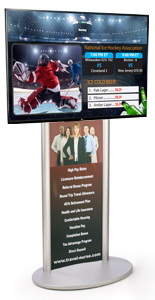 If your application doesn't require this, we suggest going with a more traditional display for your digital sign. 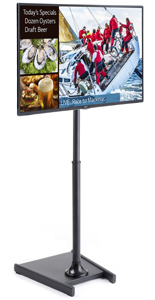 Most stands support the monitor at eye level. 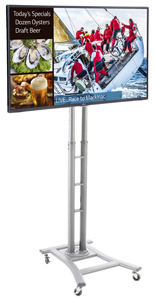 However, in situations where this would need to change, adjustable height versions are available. 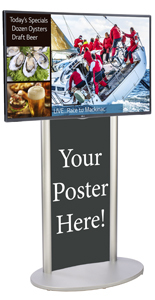 We sell a couple of racks that come with an area for displaying printed posters. 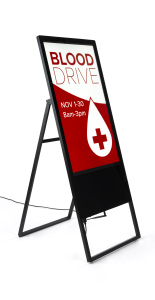 Used in tandem with the electronic sign, promotional graphics can be a great tie-in for whatever campaign you are running. 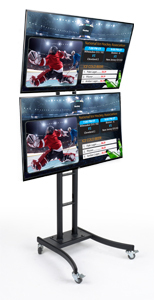 Display engaging digitized content while providing important static information (like your services and/or pricing) that always remains visible. 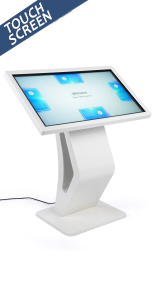 Need a truly mobile stand? 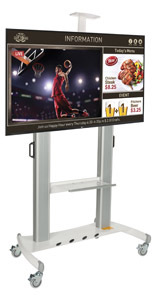 Purchase one with rolling casters. 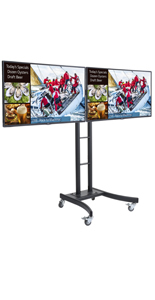 These make excellent choices for schools and offices, especially if you would need to transport the sign from one place to another. 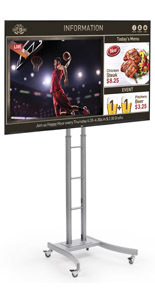 Up the sale ante for your business with electronic signs for advertising that are more engaging than static ads. 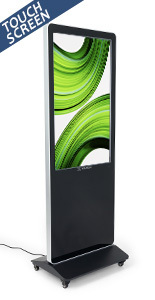 You'll find a lot of dynamic options among our collection of floor stands, each with its own unique attributes. 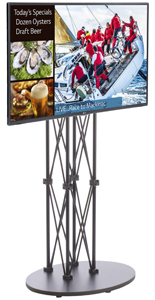 Get to know our products and how they can help you reach your sales goals. 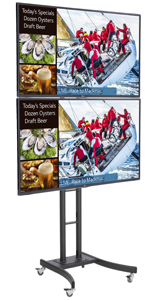 If you have any questions, contact us via chat, email, or phone and a friendly and knowledgeable sales representative will be happy to help you identify the best solutions for your advertising needs.